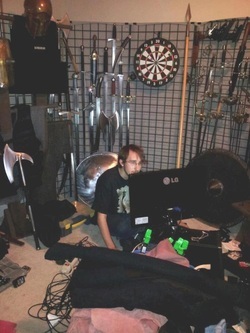 Barbarian Labs is Jay's creative violence shop, where he does fight choreography, tactical advisement, and weapons prop rental. The labs feature an in-house weaponry and armor design shop, specializing in aircraft-grade aluminum training and stunt knives and fantasy leather armor. Jay began working with chainmail in the late 90's, expanding rapidly into leather after leaving active duty in 2009. The first training and stunt knives were made in 2012, with the first online shop opening a year later.